Pitch Perfect 2 is a 2015 American musical comedy film directed and produced by Elizabeth Banks and written by Kay Cannon. It is a sequel to the 2012 film Pitch Perfect and the second installment in the Pitch Perfect film series. The film centers on the fictional Barden University Bellas, an all-female a cappella singing group, who try to beat out the German national team in a world singing championship. The film features an ensemble cast, including Anna Kendrick, Rebel Wilson, Hailee Steinfeld, Brittany Snow, Hana Mae Lee, Alexis Knapp, Ester Dean, Chrissie Fit, Kelley Jakle, and Shelley Regner, as well as Skylar Astin, Ben Platt, Adam DeVine, John Michael Higgins, and Banks all reprising their roles. It was released in the United States on May 15, 2015 by Universal Pictures. The film received generally positive reviews from critics and grossed over $287 million worldwide. It surpassed the total gross of the original film ($115.4 million) in five days, and also became the highest-grossing music comedy film of all-time, overtaking School of Rock ($131.3 million). A sequel, Pitch Perfect 3, was released on December 22, 2017. Three years after winning the previous competition, the Barden Bellas are now led by senior Beca Mitchell and three-time super senior Chloe Beale. The Bellas have become ICCA champions each of these three years. However, the group becomes involved in a national scandal (dubbed "Muffgate") when Patricia "Fat Amy" Hobart accidentally rips her pants in front of U.S. President Obama during a performance on his birthday at the Kennedy Center, showing her genitalia to the public as she did not wear underwear. This scandal leads to the Bellas' suspension from the ICCAs. Beca makes a deal to allow the Bellas to be reinstated should they win the World Championship of a cappella. Freshman Emily Junk begins her college career, hoping to follow in the footsteps of her mother Katherine by being a Bella. At orientation, she watches an a cappella performance by the Treblemakers, now led by Beca's boyfriend Jesse Swanson. Benjamin "Benji" Applebaum, Jesse's best friend, overhears Emily, leading to a crush on her. The Bellas learn that Das Sound Machine (DSM), a German powerhouse group, have replaced the Bellas on their victory tour. Additionally, Beca has started an internship at a recording studio, Residual Heat, something only Jesse knows. Emily goes to the Bellas' sorority house to audition for them because of their absence from the auditions. When she sings her unfinished song "Flashlight," she succeeds in joining the Bellas. At a car show where the ICCA winners are due to perform, the Bellas scout their replacements, DSM, led by intimidating duo Pieter Krämer and Kommissar, who take delight in mocking the all-girl group. Later, the Bellas are invited to an exclusive riff-off against DSM. Also in attendance are the Treblemakers and the Tone Hangers (a group of former Treblemakers, including former Treblemakers leader Bumper Allen, whom Fat Amy is now dating), as well as a group calling themselves the Green Bay Packers. The Bellas make it to the final two, but end up losing to DSM in the final round when a nervous Emily flubs an attempt to sing "Flashlight," her original song not from the right category ("90's Hip-Hop Jamz"). The next day at the warmups, the Bellas' chances of winning end in disaster when the performance sets Cynthia Rose Adams's hair on fire by pyrotechnics. Even before then, John and Gail question the Bellas' identity. In order to regain harmony and sync, Chloe takes them to a retreat led by former leader Aubrey Posen. Beca starts a heated debate with Chloe over herself being the only one thinking about life beyond the Bellas and Chloe's obsession with winning Worlds. To prove to her boss that she can produce music well, Beca offers Emily to produce "Flashlight" at the studio. The group realizes that they will no longer be together and may go their separate ways after graduation, and regain harmony by singing "Cups (When I'm Gone)" (the very song that got Beca into the Bellas in the first movie). Amy remembers that she broke up with Bumper, and the next day, she goes to apologize to Bumper by standing on a canoe and paddling across the lake to him while singing "We Belong." Hurt, Bumper unsuccessfully tries to turn Amy away initially, but as the song progresses, he forgives her, and they reconcile. At the studio, Emily and Beca present their song to Beca's boss, in which he demonstrates envy for their talent and looks forward to producing with them. The senior Bellas graduate and they all head off to Copenhagen for the World Finals, with Jesse and Benji to cheer them on. They perform a harmonized version of "Flashlight" with Aubrey, Katherine, and other past Bellas joining in. The Bellas win the championship and repair their damaged legacy. As the senior Bellas leave Barden, they give Emily a belated proper initiation with Fat Amy showing her how to do the last tradition: christening the house by sliding down the staircase. In a mid-credits scene, Bumper performs on The Voice, chooses Christina Aguilera as his coach and makes her uncomfortable when he gives her an oddly lengthy hug. Anna Kendrick as Beca Mitchell, the senior leader of the Bellas, known for creating the unique modern-day sound of the Bellas. She is an aspiring record producer and is now an intern at Residual Heat, a record label. Brittany Snow as Chloe Beale, the three-time super senior with a Type A personality who is the co-leader of the Bellas. Hana Mae Lee as Lilly Onakuramara, a senior Bella known for her quiet speaking voice, odd remarks, and beat-boxing. Alexis Knapp as Stacie Conrad, a senior Bella known for being overly sexual. Ester Dean as Cynthia Rose Adams, a tough senior Bella known for her strong urban vocal skills. Hailee Steinfeld as Emily Junk, a freshman legacy Bella who is an aspiring songwriter, and Benji's love interest. Her mother was also a Barden Bella, giving her the legacy status. Chrissie Fit as Flo Fuentes, a senior Bella who joined the group her sophomore year when she came to Barden University from Guatemala. Kelley Jakle as Jessica, a senior Bella. Shelley Regner as Ashley, a senior Bella. Skylar Astin as Jesse Swanson, the leader of the Treblemakers and Beca's boyfriend. Adam DeVine as Bumper Allen, Fat Amy's love interest, former leader of the Treblemakers and current member of Tone Hangers. After working for John Mayer, he returns to Barden University as a security guard. Anna Camp as Aubrey Posen, former leader of the Bellas, now runs the Lodge of Fallen Leaves. Ben Platt as Benji Applebaum, a senior Treblemaker, Jesse's best friend and Emily's love interest. Birgitte Hjort Sørensen as Kommissar, Das Sound Machine's leader. Katey Sagal as Katherine Junk, Emily's mother and a former Bella. John Michael Higgins as John Smith, an a cappella competition commentator. Elizabeth Banks as Gail Abernathy-McKadden-Feinberger, an a cappella competition commentator. Keegan-Michael Key as Sammy, Beca's boss at Residual Heat, a rude but successful producer. Shawn Carter Peterson as Dax, an intern at Residual Heat. David Cross (credited as Sir Willups Brightlysmore) as the Riff-Off host. Reggie Watts, John Hodgman, Jason Jones and Joe Lo Truglio as Tone Hanger singers. Green Bay Packers players Clay Matthews, David Bakhtiari, Don Barclay, Josh Sitton and T.J. Lang play themselves in cameos. Also appearing as themselves are Snoop Dogg, Natalie Morales, Jake Tapper, Joe Scarborough, Mika Brzezinski, Jimmy Kimmel, Rosie O'Donnell, Rosie Perez, Nicolle Wallace, Jordan Rodgers, Christina Aguilera, Adam Levine, Blake Shelton and Pharrell Williams. Robin Roberts, C.J. Perry and Kether Donohue appear as Legacy Bellas during the finale. Additionally, President Barack Obama, First Lady Michelle Obama and Shonda Rhimes briefly appear via archive footage. In December 2012, Skylar Astin revealed that he and Rebel Wilson have had meetings with Universal Studios about the potential sequel. In April 2013, it was confirmed that a sequel would be released in 2015. Elizabeth Banks directed the sequel, and Kay Cannon returned as screenwriter. Paul Brooks produced for Gold Circle Films with Banks and Max Handelman producing for Brownstone Productions. Deke Sharon returned as vocal producer, and has a brief cameo as a German reporter. As in the first movie, they ran a month of "a cappella boot camp" before filming. Anna Kendrick and Wilson returned to the cast early in 2014 to play the characters they originated in the first film. Brittany Snow reprised her character. On April 24, Chrissie Fit was added to the cast. On May 1, Hailee Steinfeld was added to the cast, playing a new member of the Barden Bellas. On May 5, Adam DeVine was reported to return in the film. On May 14, Katey Sagal was added to the cast, playing Steinfeld's character's mother. On May 29, Flula Borg was added to the cast. He played the leader of a European a cappella group, Das Sound Machine, that competed with the Bellas. It was confirmed on June 18, 2014 that Christopher Shepard was added to the cast. It was confirmed on June 19, 2014 that Pentatonix would play the role of a rival group to the Barden Bellas. It was later confirmed that The Filharmonic from season 4 of The Sing Off would make a cameo appearance as a rival group from the Philippines. On August 24, 2014 it was announced that Penn Masala, the all-male Hindi a cappella group from director Elizabeth Banks's and producer Max Handelman's alma mater The University of Pennsylvania, would be featured as a team from Southeast Asia. On June 25, Birgitte Hjort Sørensen was confirmed added to the cast. On May 21, 2014, principal photography began at Louisiana State University (LSU) campus in Baton Rouge. On December 3, 2014, Mark Mothersbaugh was hired to compose the music for the film. The official soundtrack was released on May 12, 2015. The special edition soundtrack was later released on August 8, 2015. The original album debuted at number one on the Billboard 200, earning 107,000 album-equivalent units (92,000 copies of traditional sales) in the week ending May 17, 2015. 5. "Winter Wonderland/Here Comes Santa Claus"
6. "Riff Off (Thong Song/(Shake, Shake, Shake) Shake Your Booty/Low/Bootylicious/Baby Got Back/Live Like You Were Dying/Before He Cheats/A Thousand Miles/We Are Never Ever Getting Back Together/What's Love Got to Do with It/This Is How We Do It/Doo Wop (That Thing)/Poison/Scenario/Insane in the Brain/Flashlight)"
12. "Any Way You Want It (World Championship Medley)"
9. "Winter Wonderland/Here Comes Santa Claus"
10. "Riff Off (Thong Song/(Shake, Shake, Shake) Shake Your Booty/Low/Bootylicious/Baby Got Back/Live Like You Were Dying/Before He Cheats/A Thousand Miles/We Are Never Ever Getting Back Together/What's Love Got to Do with It/This Is How We Do It/Doo Wop (That Thing)/Poison/Scenario/Insane in the Brain/Flashlight)"
16. "Any Way You Want It (World Championship Medley)"
The film was released on May 7, 2015 in Australia and New Zealand, and May 15 in the United States and Canada. A still from the rehearsals for the film was revealed on May 16, 2014. The poster was released on November 18, 2014 and the trailer came out the following day. A second trailer was aired during Super Bowl XLIX on February 1, 2015. Director Elizabeth Banks stated an additional performance by the Treblemakers was filmed specifically for the DVD release. Also included on the DVD will be deleted scenes. On May 20, 2015, it was announced that FX Networks had acquired U.S. television broadcasting rights to the film. The Blu-ray and DVD editions of Pitch Perfect 2 were released on September 22, 2015 in the U.S. with a Target-exclusive edition containing additional bonus features being released the same day. Pitch Perfect 2 was released on 4K UHD Blu-Ray on March 10, 2018. Pitch Perfect 2 grossed $184.2 million in North America and $103.2 million in other territories for a worldwide total of $287.5 million, against an estimated gross production budget of $29-31 million, and the film was offered up to $8.9 million in production incentives and write-offs by the state of Louisiana. In its first five days, the film surpassed the total gross of the original ($115.4 million), and also overtook School of Rock ($131.3 million) for the highest grossing musical-comedy of all-time and the second greatest musical debut ever (behind Beauty and the Beast's $174.8 million in 2017). Deadline Hollywood calculated the net profit of the film to be $139.6 million, when factoring together all expenses and revenues for the film. In the United States and Canada, Pitch Perfect 2 grossed $4.6 million from Thursday night showings and $27.8 million on its opening day, increasing the opening weekend projections from $40 million to $64 million. In its opening weekend, the film grossed $69.2 million, finishing first at the box office. The opening weekend gross was more than the entire North American total gross of the first film ($65 million), is the third biggest PG-13 comedy opening of all-time (behind The Simpsons Movie's $74 million in 2007 and Austin Powers in Goldmember's $73 million in 2002) and the highest grossing opening ever for a musical. Outside North America, the film opened at number one in Australia and New Zealand, earning $7.6 million and $1.2 million respectively. The film grossed $22.1 million in Australia, $27.3 million in the United Kingdom and $2.7 million in New Zealand. On Rotten Tomatoes, the film has an approval rating of 65% based on 197 reviews, with an average rating of 6/10. The site's critical consensus reads, "Pitch Perfect 2 sings in sweet comedic harmony, even if it doesn't hit quite as many high notes as its predecessor." On Metacritic, the film holds weighted average score of 63 out of 100, based on 39 critics, indicating "generally favorable reviews". In CinemaScore polls conducted during the opening weekend, cinema audiences gave the film an average grade of "A–" on an A+ to F scale. On April 11, 2015, a month before the release of the Pitch Perfect 2, it was announced that Rebel Wilson would return for a third film, although she stated that she did not know if Anna Kendrick or any of the other cast members would also be reprising their roles. She added that she would be "up for a Fat Amy spin-off," although nothing had yet been confirmed. Director, star, and producer Elizabeth Banks acknowledged the possibility of a third film, saying, "I will say, it would be disingenuous to say that no one's talking about a Pitch Perfect 3; the possibility of it. We are really focused on getting as many butts in seats for this one. If fans embrace it, we are going to seriously think about what the continuing journey would look like, but we don’t know what that is yet". On June 10, 2015, a third film was officially confirmed, with Kay Cannon returning to write the script. Several days later it was announced both Kendrick and Wilson would reprise their roles, and later Brittany Snow was also confirmed to return. Banks returned to produce, but in June 2016 it was announced she would not be directing the film. The film was originally slated for a July 21, 2017 release, and was later pushed back to August 4, 2017 before moving back to the July 21 slot. In May 2016 it was moved again, this time being pushed back to December 22, 2017. ^ "PITCH PERFECT 2 (12A)". British Board of Film Classification. April 20, 2015. Retrieved April 20, 2015. ^ a b Brent Lang (May 7, 2015). "Box Office: 'Mad Max: Fury Road,' 'Pitch Perfect 2′ Eye $40 Million Openings". Variety. (Penske Media Corporation). Retrieved May 8, 2015. ^ a b FilmL.A. (June 15, 2016). "2015 Feature Film Study" (PDF). Retrieved June 16, 2016. ^ a b "Pitch Perfect 2 (2015)". Box Office Mojo. Retrieved December 14, 2015. ^ a b "List of Top Grossing Music Comedy Films, 1984-Present". Box Office Mojo. Retrieved December 13, 2014. ^ a b Anita Busch. "'Pitch Perfect 3′ Gets Summer 2017 Bow; Anna Kendrick, Rebel Wilson Back - Deadline". Deadline Hollywood. ^ a b "'Pitch Perfect 3' Pushed Back". Deadline Hollywood. September 29, 2015. Retrieved October 11, 2015. ^ Orange, B. Alan (December 19, 2012). "EXCLUSIVE: Pitch Perfect 2 in the Works; Rebel Wilson to Return". MovieWeb.com. Retrieved May 16, 2015. ^ Smith, Grady (April 16, 2013). "'Pitch Perfect' sequel coming in 2015". Entertainment Weekly. Retrieved June 14, 2013. ^ a b Kroll, Justin (January 27, 2014). "Elizabeth Banks to Direct 'Pitch Perfect 2'". Variety. PMC. Retrieved January 27, 2014. ^ Profile, indystar.com, February 25, 2015; accessed May 16, 2015. ^ Pitch Perfect 2 – Featurette: "Aca-Bootcamp" (HD). YouTube. May 5, 2015. ^ Highfill, Samantha (February 6, 2014). "Anna Kendrick, Rebel Wilson will return for 'Pitch Perfect 2'". Entertainment Weekly. Retrieved February 7, 2014. ^ Bahr, Lindsaay (February 14, 2014). "Casting Net: Brittany Snow is back for 'Pitch Perfect 2'; Plus, Jessica Alba, more". Entertainment Weekly. Retrieved February 15, 2014. ^ "Chrissie Fit Cast In 'Pitch Perfect 2′". deadline.com. April 24, 2014. Retrieved April 25, 2014. ^ "Hailee Steinfeld Joining Pitch Perfect 2". vulture.com. May 1, 2014. Retrieved May 1, 2014. ^ Strecker, Erin (May 5, 2014). "Adam DeVine will return for 'Pitch Perfect 2'". ew.com. Retrieved May 7, 2014. ^ Kroll, Justin (May 14, 2014). "Katey Sagal Joins Cast of 'Pitch Perfect 2′". variety.com. Retrieved May 15, 2014. ^ Yamato, Jen (May 29, 2014). "'Pitch Perfect 2′ Adds German YouTuber Flula Borg". deadline.com. Retrieved May 30, 2014. ^ Stack, Tim (November 21, 2014). "Game On, Pitches!". EW.com. Entertainment Weekly & Time Inc. Retrieved November 24, 2014. ^ Banks, Elizabeth (June 20, 2014). "'Pitch Perfect 2′ Extra: Christopher Shepard!!! This is a mash up of Pitch Perfect 2 and The Hunger Games. Amazing crowd, THANK YOU". deadline.com. Retrieved June 20, 2014. ^ Pentatonix to appear in Pitch Perfect 2, insidemovies.ew.com; accessed May 16, 2015. ^ Rebecca Ford. "'Pitch Perfect 2' Adds 'The Sing-Off' A Cappella Group The Filharmonic (Exclusive)". The Hollywood Reporter. ^ Lim, Eunice (August 24, 2014). "The South Asian a cappella group is the only real collegiate performance group in the movie". The Daily Pennsylvanian. Retrieved May 8, 2015. ^ Tauber, Michelle; Price, Lydia (May 13, 2015). "Pitch Perfect 2: All the Details Behind UPenn's A Cappella Group Cameo". People.com. Retrieved May 18, 2015. ^ Yamato, Jen (June 25, 2014). "'Pitch Perfect 2′ Taps Danish Import Birgitte Hjort Sørensen". Deadline Hollywood. Retrieved June 26, 2014. ^ Christine (May 20, 2014). "'Pitch Perfect 2′ is filming at LSU tomorrow with lots of extras". onlocationvacations.com. Retrieved May 26, 2014. ^ "Mark Mothersbaugh to Score 'Pitch Perfect 2′". filmmusicreporter.com. December 3, 2014. Retrieved December 14, 2014. ^ a b "iTunes – Music – Pitch Perfect 2 (Original Motion Picture Soundtrack) by Various Artists". iTunes. ^ a b Pitch Perfect 2: Special Edition (Original Motion Picture Soundtrack), itunes.apple.com; accessed January 2, 2016. ^ Keith Claufield (May 20, 2015). "'Pitch Perfect 2' Soundtrack Debuts at No. 1 on Billboard 200 Albums Chart". Billboard. (Prometheus Global Media). Retrieved May 20, 2015. ^ "Australiancharts.com – Soundtrack – Pitch Perfect 2". Hung Medien. Retrieved May 16, 2015. ^ "Austriancharts.at – Soundtrack – Pitch Perfect 2" (in German). Hung Medien. Retrieved May 30, 2015. ^ "Ultratop.be – Soundtrack – Pitch Perfect 2" (in Dutch). Hung Medien. Retrieved May 24, 2015. ^ "Soundtrack Chart History (Canadian Albums)". Billboard. Retrieved May 30, 2015. ^ "Longplay-Chartverfolgung at Musicline" (in German). Musicline.de. Phononet GmbH. Retrieved May 24, 2015. ^ "Charts.org.nz – Soundtrack – Pitch Perfect 2". Hung Medien. Retrieved May 30, 2015. ^ "Swisscharts.com – Soundtrack – Pitch Perfect 2". Hung Medien. Retrieved May 24, 2015. ^ "Weekly Top 20 – Five Music Chart 2015/5/15 - 2015/5/21" (in Chinese). Five Music. Retrieved May 21, 2015. ^ "Soundtrack Chart History (Digital Albums)". Billboard. Retrieved May 30, 2015. ^ "Soundtrack Chart History (Billboard 200)". Billboard. Retrieved May 30, 2015. ^ "Soundtrack Chart History (Vinyl Albums)". Billboard. Retrieved May 30, 2015. ^ "ARIA Charts - End of Year Charts - Top 100 Albums 2015". Australian Recording Industry Association. Retrieved January 6, 2016. ^ "TOP BILLBOARD 200 ALBUMS: YEAR END 2015". Billboard. Retrieved December 10, 2015. ^ "IMDb Pitch Perfect 2". Retrieved February 1, 2015. ^ Anderton, Ethan (May 16, 2014). "First Look: Anna Kendrick & Barden Bellas Back in 'Pitch Perfect 2'". firstshowing.net. Retrieved May 16, 2014. ^ Super Bowl Official Trainer. ^ Denise Petski. "'Pitch Perfect 2′ Heads To FX — Network Lands Exclusive TV Rights – Deadline". Deadline Hollywood. ^ "Pitch Perfect 2 Blu-ray". Blu-ray.com. Retrieved July 8, 2015. ^ "Pitch Perfect 2 Target edition Blu-ray". Blu-ray.com. Retrieved July 8, 2015. ^ "Pitch Perfect 2 - 4K Ultra HD Blu-ray Ultra HD Review | High Def Digest". ultrahd.highdefdigest.com. Retrieved May 4, 2018. ^ Mike Fleming Jr (March 22, 2016). "No. 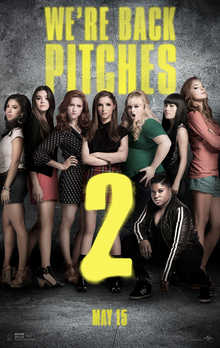 11 'Pitch Perfect 2' – 2015 Most Valuable Movie Blockbuster Tournament". Deadline Hollywood. Retrieved March 23, 2016. ^ Pitch Perfect 2 blows away Mad Max and heads for $64 million debut, thewrap.com; accessed May 17, 2015. ^ Nancy Tartaglione (May 10, 2015). "'Pitch Perfect 2′ Sings, Soars Down Under; 'Ultron' Adds $68.3M – Intl Box Office". Deadline Hollywood. (Penske Media Corporation). Retrieved May 10, 2015. ^ "Pitch Perfect 2 (2015)". Rotten Tomatoes. Retrieved November 10, 2015. ^ "Pitch Perfect 2 reviews". Metacritic. Retrieved May 17, 2015. ^ "Box Office: Pitch Perfect 2 Pitch-Slaps Mad Max: Fury Road". comingsoon.net. Retrieved May 19, 2015. ^ "'Pitch Perfect 3' in the Works; Rebel Wilson to Return". Collider. Complex Media. April 11, 2015. Retrieved May 17, 2015. ^ Steve Weintraub (May 16, 2015). "Elizabeth Banks talks Pitch Perfect 3". Collider. Complex Media. Retrieved May 17, 2018. ^ "Brittany Snow Set to Return for 'Pitch Perfect 3′". Variety. (Penske Media Corporation). July 28, 2015. Retrieved August 7, 2015. ^ D'Alessandro, Anthony (May 31, 2016). "Universal Changes 'Pitch Perfect 3' Release Date Again; 'Girl Trip' Moves In".